Bulb Eater Services Program is perfect for those businesses that thought that a Bulb Eater made economic sense but couldn’t get budget approval. 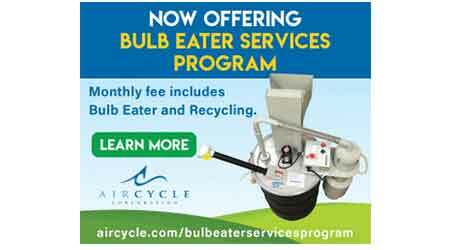 This program includes the use of a Bulb Eater, maintenance parts, recycling and transportation charges, and Total Program Management sustainability reporting; all for one monthly expense! Join many others in the goal to trim labor and recycling costs. Make recycling fun while reducing your waste footprint in our ecosystem. Contact 800-909-9709 for more information on the Bulb Eater 3L with Intelli Technology.